MEITNER, Lise (1878-1968). Wärmeleitung in inhomogenen Körpern. Offprint from: Sitzungsberichten der kaiserl. Akademie der Wissenschaften in Wien. Mathem.-naturw. Klasse, Bd. 115, Abt. IIa, February 1906. Vienna: Kaiserlich-Königlichen Hof- und Staatsdruckerei, 1906. 8o. Original printed wrappers (fore-edge slightly frayed), unopened; cloth folding case. 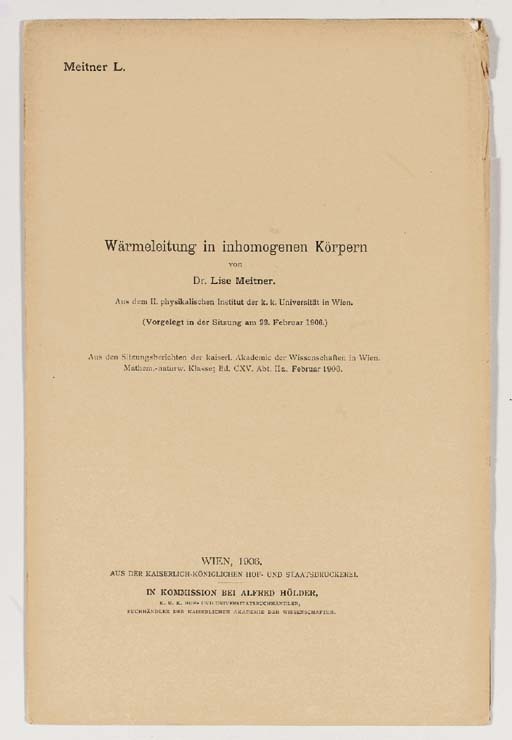 FIRST EDITION, offprint issue of Lise Meitner's doctoral dissertation on the heat conduction in non-homogeneous metals. Meitner had studied with Ludwig Boltzmann, and was only the second woman to receive a PhD in Physics from the University of Vienna. She would become the most prominent female nuclear physicist of the 20th century, best-known for her co-discovery of nuclear fission in 1939.